Line Concentrator 3 to 1 - up to 3 separate C.O. lines to connect to one telcom device. On incoming calls, each of the three lines can ring one specific device. The C-1000B Line Concentrator is reliable and compatible! Manufactured to strict standards in the USA. The C-1000B Line Concentrator is compatible with virtually all analog phones lines, communications equipment and phone systems. The C-1000B Line Concentrator 3 to 1 allows up to 3 separate C.O. lines to connect to one telecom device. The C-1000B Line Concentrator 3 to 1 eliminates the need for dedicated incoming phone lines by making your phone system more efficient. One fax machine, answering machine, modem or any phone device can answer 2 or 3 phone lines. When a device, such as a modem or a fax maxine needs incoming access to more than one phone line, the Line Concentrator will allow it access 2 or 3 phone lines. The C-2000B allows single line phones or phone systems to share 1-3 phone lines. Use the C-1000B Line Concentrator 3 to 1 to share multiple lines between single line phones, a single modem, one fax machine or fax modem, as well as any other phone connected equipment. All incoming calls from all 3 of the lines ring only one device. All outgoing calls go out on line one unless you enter a security access code. For line 2 simply push #1 on your telephone keypad. To access line 3 push #3 on your keypad.  Saves Money by eliminating dedicated phone lines! 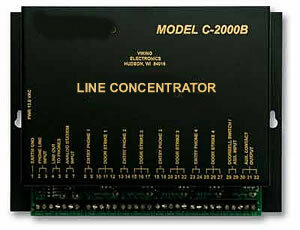 The C-1000B Line Concentrator is made in the USA. Interested in purchasing the C-1000B LineConcentrator? Questions about the C-1000B Line Concentrator?